Rice Crispy Treats are pretty awesome to find anytime, but a Halloween monster rice treat is even more awesome. These monsters are hand dipped in chocolate and have tons of eyeballs. Check out the recipe on One Little Project at a Time here. Muddie Buddies, Puppy Chow… regardless of the name this snack mix is great for any holiday. This mix has the crunchy cereal pieces and sprinkles you know, but has bits of Halloween candy inside along with a couple other surprises. Get ready to make this recipe by grabbing the recipe on A Pumpkin & a Princess here. Every kid loves chocolate covered pretzels. Use sprinkles, edible eyeballs, and fun colored chocolate melts to make these festive friends. Your kids will love these so much that they’ll be begging to help make another batch. See the recipe on Garnish & Glaze here. Ready to make some Halloween snacks? 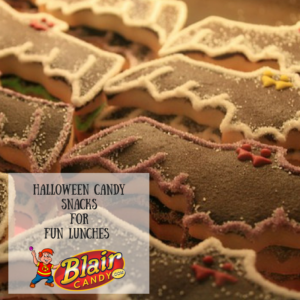 Stock up on Halloween candy for these treats and for the big day by visiting BlairCandy.com. Be sure when you’ve finished your treats that you share them on social media and tag us!